The driver can operate all the electric windows. – Press the switch as far as the first stop and hold it until the window has moved to the desired position. – Press the switch briefly to the second stop: the window will automatically open all the way. – Pull the switch as far as the first stop and hold it until the window has moved to the desired position. – Pull the switch briefly to the second stop: the window will automatically close all the way. When the safety switch S, fig. 49 is pressed in, the symbol in the switch lights up. The window switches in the rear doors are deactivated. • Always take the key with you when leaving the vehicle - even if you only intend to be gone for a short time. This is especially important if children are left in the car. They might otherwise be able to start the engine or use power-operated equipment such as the electric windows - this could lead to injuries. 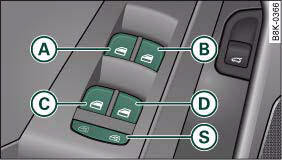 The window switches are only deactivated when the driver's door or the front passenger's door is opened. • Always be careful when closing the windows. Careless use of the electric windows can cause severe injuries. • When locking the vehicle from the outside, make sure that nobody is inside the vehicle, as the windows cannot be opened from the inside in an emergency. The windows can be operated for about ten minutes after the ignition has been switched off. The window switches are only deactivated when the driver's door or the front passenger's door is opened. The convenience open/close function allows you to open and close the windows and the sun roof* with the remote control key. You can select which windows are opened in the settings on the sound system or MMI*. – Press and hold the unlocking button | on the remote control key until the windows have reached the desired position and the sun roof* is open. 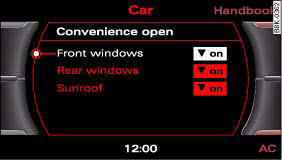 – Press and hold the locking button } on the remote control key until the windows and the sun roof* are closed ⇒ . – Touch and keep your hand in contact with the locking sensor on the door handle until the windows and the sun roof* are closed. • Take care when closing the windows and the sun roof*. Careless or uncontrolled use can cause injuries. • For safety reasons, you should only use the remote control open and close functions within about 2 metres of the vehicle. To avoid injuries, always keep an eye on the windows when pressing the button to close them. The windows and sun roof stop moving as soon as the button is released. The driver can use the sound system or MMI* to select which windows are opened. – Select: Function selector button CAR > Windows > Convenience open. If you wish to use the convenience open function for the windows and the sun roof*, select on for the functions Front doors, Rear doors and Sun roof*. The one-touch open and close function must be reactivated if the battery has been disconnected. – Pull and hold the electric window switch until the window is fully closed. – Release the switch and then pull it again for at least one second.